The sound quality of this tape seems about the same as the bootleg (decidedly lo-fi) but possibly a generation or two closer to the source. This tape also has more hiss and more high end. Perhaps the bootleggers used some noise reduction somewhere along the way. What this is: This is a tape of Lou Reed and Nico rehearsing that's commonly referred to as "The Bedroom Tape." It's been claimed that this was recorded in a hotel room. There have also been claims made that this is a rehearsal for the 1972 Nico-Lou Reed-John Cale concert at Le Bataclan in Paris. Neither statement is correct, as I'll explain below. Date and Location: The notes in the previous upload say, "Though the CD art says "New York 1968", this is usually dated "April 1970" or just "1970", and is said to have been recorded in Nico's hotel room. When this boot was originally posted on EZT in January 2005 someone commented that it is actually from January 1972, prior to Reed, Nico, and Cale's January 29 show at Le Bataclan." Regarding the location: The voices of the other people on this tape are clearly those of Lisa and Richard Robinson, indicating that this is probably another of the many tapes made in their apartment. At the very beginning of the tape, Lou says to Nico, "You took the wrong train and ended up at 125th Street?" Nico replies, "And I walked to 1st Avenue from 6th Avenue." Lisa asks, "Which train did you take?" Nico says, "The 8th Avenue train." There's an 8th Avenue, a 6th Avenue, a 1st Avenue, and a 125th Street (as well as an 8th Avenue train) in New York but not in Paris. Later in the tape, you can hear Lisa offering them tea and coffee and then clattering around in the kitchen. She's clearly in her own apartment and not in a hotel room. At another point, Danny Fields (who signed the MC5 and the Stooges to Elektra and who wrote the liner notes to the Velvets' "Live at Max's" album) drops by. Danny, who lived in New York at the time, wouldn't be just dropping by if this took place in Paris. At yet another point, Lou mentions that he wants to borrow Lenny Kaye's guitar for the gig. Lisa offers to call Lenny. Back then, making a transatlantic phone call was sort of a big deal, and I seriously doubt that that's what Lisa was volunteering to do. 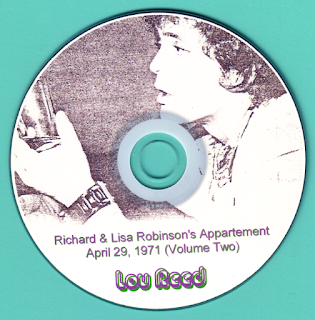 Regarding the date: Richard and Lisa made many tapes of Lou in their apartment, and all the ones that I've heard all date from the spring and summer of 1971, when Lou was inbetween the Velvets and the beginning of his solo career. In track 50, Lou (while talking to Danny Fields) mentions that he's trying to figure out whether he should stay with Atlantic (the label that released the final Velvet Underground album) or sign with another label. That clearly puts this recording as post-Velvets and before the start of Lou's solo career. Lou left the Velvets in August, 1970, and reportedly didn't even think about music for a few months, so that would seem to support the April, 1971 date. Similarly, by January, 1972, Lou had signed with RCA and was recording his first album, so this tape simply can't have anything to do with the rehearsals for the Bataclan show at the end of January of 1972. 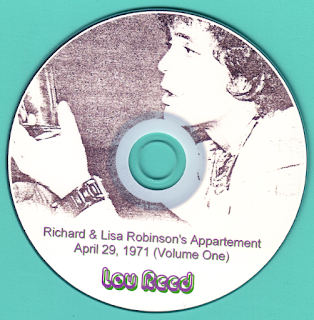 Additionally, at one point, Lisa mentions that Richard has just gotten a video recorder. There's at least one circulating audiotape that was made from the soundtrack to a Richard Robinson video shot about two weeks later, on May 16, 1971. A little more background info: The way I heard it was that these rehearsals were for a solo Nico appearance in New York where Lou was to back her up on acoustic guitar. 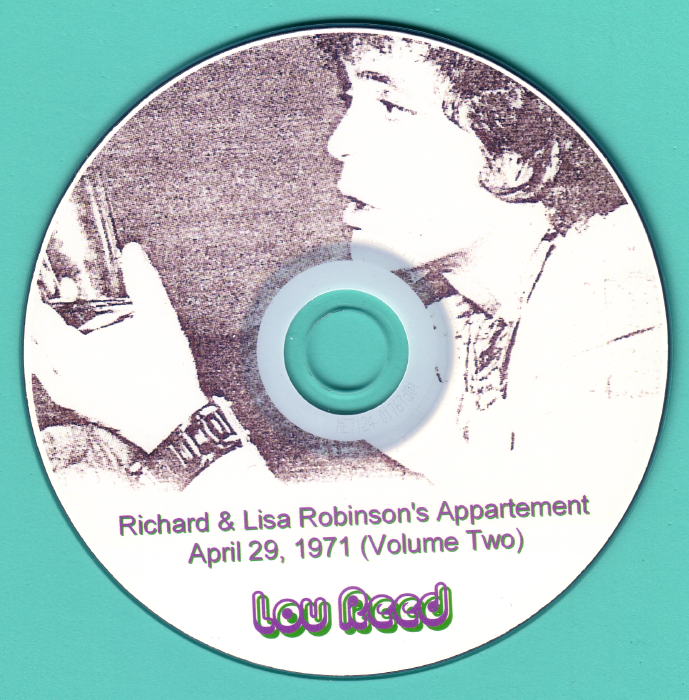 Lisa and Richard had taped Lou many times, but when they asked to tape this rehearsal, Lou refused. They taped the rehearsal anyway, with a cassette deck hidden under the sofa. That's why the sound is sort of muffled and distant and doesn't have the clarity of the other Robinson apartment tapes. That's also why at times Lisa's footsteps are so loud--she's walking right in front of the recorder. The gig itself never took place (once again, this is hearsay) because Nico got in a fight with a woman in a bar and decided to leave the country rather than have the woman press charges. Officially released material: At times during the rehearsal, Lou and Nico played tracks from the first Velvets album and from Nico's solo albums. All of this has been edited out except for three brief sections, included with the consent of the mods, where Lou and Nico are talking during the tracks or Lou is tuning his guitar to the track. Special thanks to Ruby Tuesday and jupiter2101 for their help.